MATERIAL: Fiberglass core encapsulated in Polyvinyl Chloride Film or Sailcloth. PATTERN: Plain  Type A or Type B mounting. 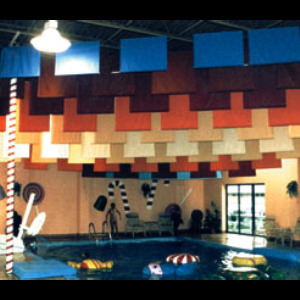 FEATURES: Cost effective, lightweight, high acoustical performance, moisture and chemical resistant. APPLICATIONS: Any large area where noise and reverberation needs to be reduced. Gymnasiums, community centers, sports arenas, lunch rooms, swimming pools, factories, animal hospitals, food processing plants, large open plan areas. CORE DENSITY: 1#, 1.65#, 2.25# & 3#/cub. ft.
COLOR: PVC Film  9 Colors; Sailcloth  9 colors. FLAMMABILITY: Class A Sailcloth ASTM E84, F/S 15 S/D 30. PVC, F/S 25 S/D 30. 2H4 Beam Clamp 3/32"  9/64"
H24 Beam Clamp 1/8"  1/4"